Gunners and Runners portrays two modes of intercultural displacements along with Arsenal’s relocation in North London’s Finsbury Park: The new Emirates stadium, a world-class stadium financed by Dubai’s state airlines, comes up against the contested infrastructures of Islamic migration. In the encounters and intermixing of English football fans with the migrant population, the urban space becomes a stage for the ambiguities of prosperity, legality and security with which the neo-liberal transformation of western society operates. Starting June 9th there will be excitement and prayers, tears and shouts of jubilation, fist fights and dancing, racist jibes and anti-racist agitation: The World Cup inflames the passions of millions. 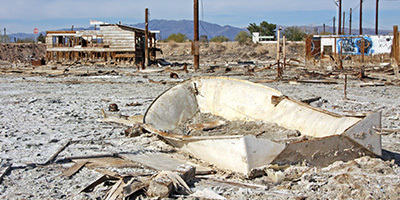 The O.K Center for Contemporary Art traces the enormous emotional impact of fandom and positions art, film, documentation, the self-aestheticization of fans and fan commerce in a highly charged relationship. You‘ll never walk alone - the exhibition named after the legendary battle hymn from Liverpool additionally seeks to reconstruct changes in the concept of fans through a reflection on the space of the stadium: from the everyday cultural rituals of the crowd, through hooligan branding and all the way to domestication in the "disneyfied" and rigidly monitored entertainment arenas of the present. Works by Stephen Dean FR/US, Josef Dabernig /AT, Massimo Furlan /CH, Julie Henry /GB, Peter Hörmanseder /AT, Kurt Lackner /AT, Peter Mörtenböck & Helge Mooshammer /AT, Antoni Muntadas /ES, Grazia Toderi /IT Auftragsarbeiten von: Wolfgang Dorninger /AT, Barbara Musil & Gunda Wiesner/AT, Antonio Ortega /ES. Objects and photographs from "Progetto Ultra", IT fan archive, Gerd Dembowski’s /DE and Dieter Brasch’s /AT privat archives, the collection Klaus Littmann /CH and Claude Pascal‘s /CH record collection. On 12 May 2006 Arsenal, a London football club steeped in tradition which is also known as the Gunners, played its last home game at Highbury Stadium, a venue equally rich in tradition. The name Gunners stems from the site on which the club was founded, the former Royal Arsenal munitions factory in the London suburb of Woolwich near the Thames, which in the 19th century was one of England's most important armaments production facilities. 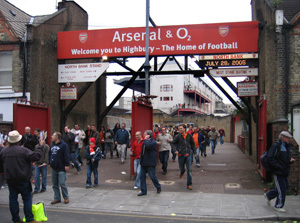 Highbury Stadium, the home of the Gunners from 1913 to 2006, grew up around a playing field situated between gardens and backyards and was integrated seamlessly into the small-scale contours of a Victorian residential neighbourhood, where on match days kiosks, takeaways and souvenir stands were unceremoniously set up in front gardens and driveways. In the weeks leading up to the closure of the stadium, British newspapers such as the Evening Standard and the Guardian devoted entire extra supplements to wistful obituaries for this historic London venue. “Highbury wasn’t just any stadium, Highbury was a cathedral of football.” The end of ‘Highbury’ also brought to an end the sacral practices with which the stadium was staged as a representation of British community. In Ashburton Grove, 500 meters away from the old venue, there is now a new stadium complex equipped with VIP lounges, luxury restaurants and a multimedia infrastructure that has been co-financed by Emirates, the Saudi Arabian state airline. This transition from a cathedral of football to a cathedral of consumption marks not only a local but also a cultural change: from community-based pubs and fish-and-chip stalls to the comprehensive commercial use of multifunctional stadium structures, from a locally orientated, English working-class culture to a globalised world of flows. 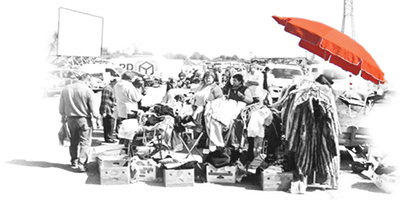 The upper end of this transformation is served by the flows of capital, the lower end by the flows of migration. Thus, two geographies of upheaval meet directly at the intersection point constituted by North London’s Finsbury Park: the world of football and the postcolonial world of Islamic cultures in Europe. This atomisation of an unambiguous relationship between sociality and space is taking place on two levels simultaneously. One level involves the confrontation of a locally shaped football culture with globally operating finance capital; this includes the purchase of naming rights for the stadium by the Dubai-based Emirates airline as it does the expectations linked with the stadium relating to London’s claim to a place in the league of global cities. The other level concerns the intermixing of an introspective English residential neighbourhood with the networks of the global jihad. 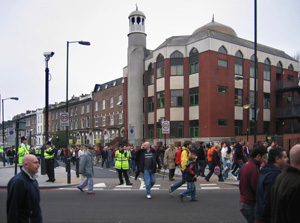 Nearby the stadium stands the Finsbury Park Mosque, which was opened in 1990 by Prince Charles and King Fahd of Saudi Arabia, and which, between 1997 and 2003, served as a gathering point for supporters of Islamic extremism inspired by the teachings of the resident radical cleric Abu Hamza al-Masri. In January 2003 a raid by British anti-terrorist units uncovered not only fake passports and credit cards but also CS gas, hunting knives and hand guns. 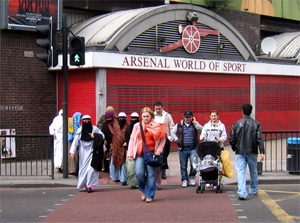 Conservative newspapers reacted by describing the mosque as a “honey pot for terrorists” and as an “arsenal for Islamic terror.” After being stripped of his status as an imam, Abu Hamza continued to preach to his supporters in front of the mosque on St. Thomas’s Road, on the very stretch of street used by Arsenal fans on their regular pilgrimage to their stadium. In the spring of 2006, recordings of these street sermons led to Abu Hamza’s arrest and conviction for incitement to racial hatred and incitement to murder. Now under new leadership, the Finsbury Park Mosque  which was renamed the North London Central Mosque in 2005  currently enjoys a high level of attendance, and the local network of businesses and facilities for immigrants from various parts of the Islamic world is growing rapidly. On match days the Arsenal fans now make their way to 'their' club through a multi-ethnic neighbourhood in which more than 120 languages are spoken, passing mosques and Muslim welfare houses, Halal butcher shops, internet cafés, Maghrebi snack bars and cafés with names like Salam, Aladdin and Paradise, specialised travel agents and bedsit agencies, Islamic bookshops and scarf shops. These concentrated financial and migratory links with the Mahgreb and the Near and Middle East in Finsbury Park have led to a cultural and economic coexistence of religion and football, prayer rituals and pre-match anthems, international financial operations and local street culture. It is not only football but culture that is no longer, as the 1996 football hymn Three Lions put it, “coming home.” The mourning of Arsenal’s Highbury Stadium opened up a space for a more reaching farewell, a farewell to the idea that access to the understanding of culture is to be found in identitary configurations. The wistful final salute to the old Arsenal stadium marked a transformation that all European cultures are experiencing: a shift from an unambiguous socio-cultural belongingness and security experienced as familiar and homelike to a fragmented, kaleidoscopically refracted world in which our living spaces are no longer defined and shaped ‘by ourselves’ but in an interplay with the conditions and prescriptions of global deregulation.